It is a bit of work, at least if you want to make a fancy pie crust like I did. Obviously you can also keep it simple. This was for meditation, actually. But apart from the enormous filling (have I mentioned often enough that I loooove filling?) the crust is also super easy and super delicious. Trust me. It follows the German pie crust rule. Which one that is, you ask? It is the 3-2-1 rule. 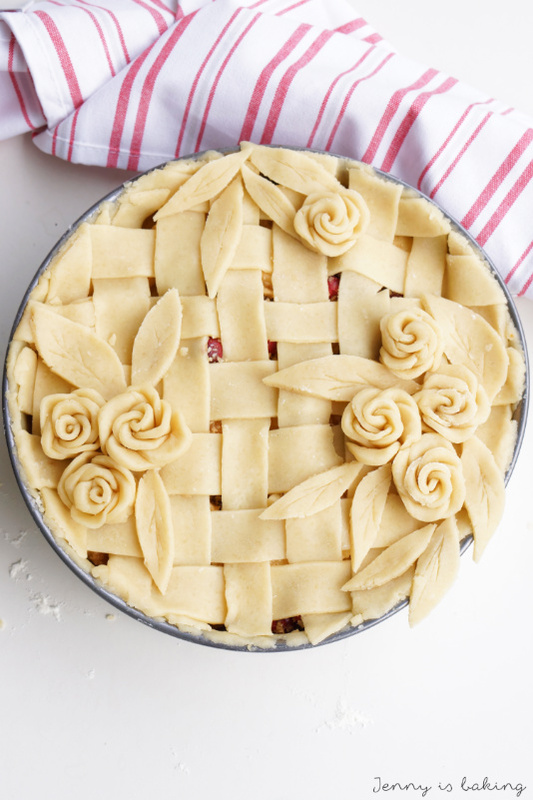 A pie crust is usually created with three parts of flour, two parts of butter and one part of sugar. Ok, for pie usually the amount of sugar is reduced as the filling is already sweet. But it works like a charm. 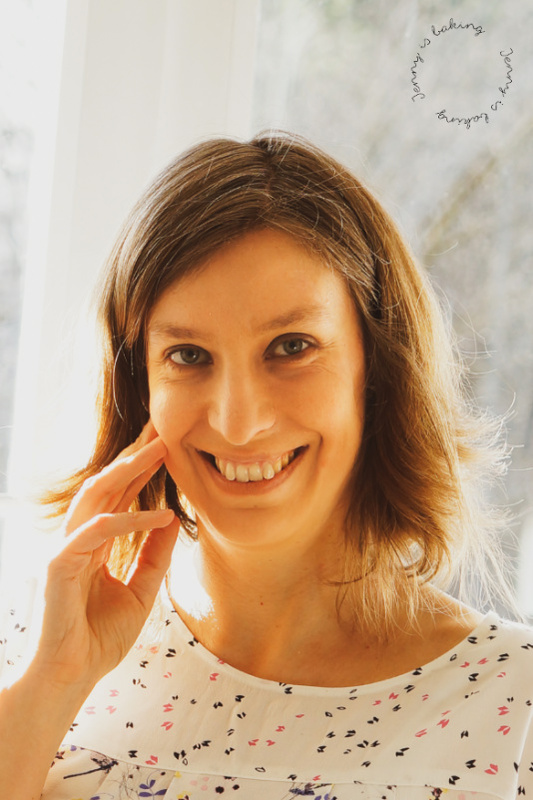 Just to be sure, I dedicated an entire blog entry how to make it perfectly. 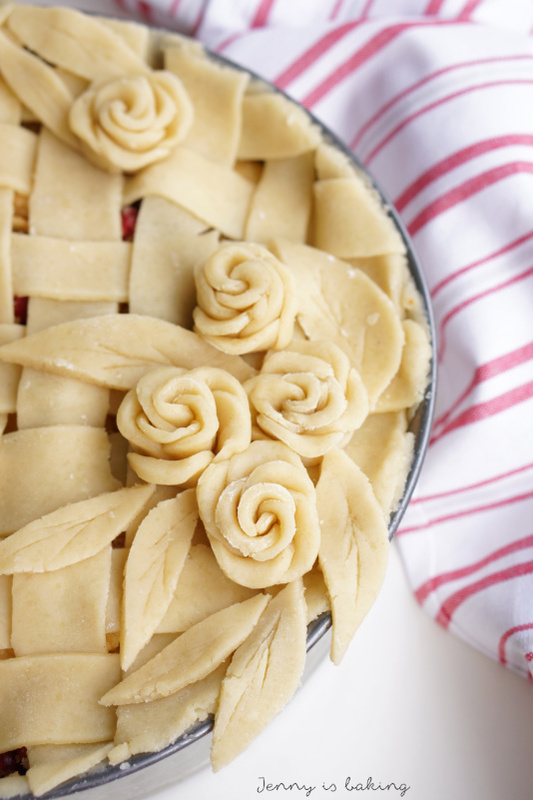 The pretty roses, for which you will also find instructions below how to form, are made with this pie crust. Easy peasy. For the sugared cranberries dissolve 200 grams of sugar in boiling water. Soak cranberries in sugar water overnight. The next day drain cranberries and roll in 200 grams of sugar. Let dry on parchment paper for a few hours. Meanwhile prepare the pie crust by making crumbs with all ingredients except for the water. This is best done with the kneading attachment of a mixer or with your hands. Add water, one tablespoon at a time and kneed with your hands until you can form into a ball. Chill for at least half an hour in the fridge with plastic wrap. Cut dough in half, transfer one half back to fridge. Roll out other half larger than your deep-dish pie pan and be sure it covers it completely. I even used a springform as you can see on the pictures. Chill until you are ready with the filling. For the filling peel apples and slice thinly. 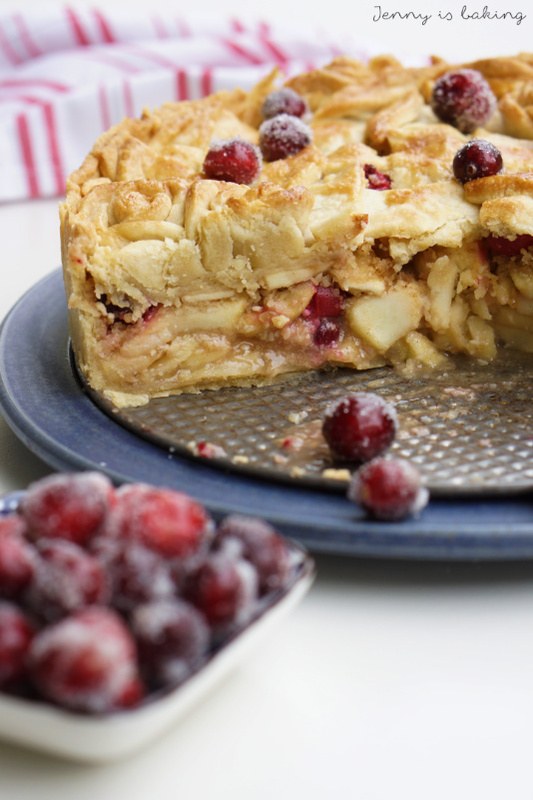 Mix with remaining ingredients in a large bowl and pour over pie crust. Put pie back into the fridge. For the decorated pie crust roll out second half of dough. First create lattice decoration. Cut out about eight small circles with cookie cutter, line them up, and roll them up. Cut in half and bend rose leaves a little. See step-by-step instructions for further guidance. Cut out leaves, etc. to your liking and decorate pie with it. Brush with egg wash and sprinkle coarse sugar on top. Bake pie at 210 degrees Celsius for 20min, then cover fully in aluminium foil and bake for another 30min at 180 degrees Celsius. 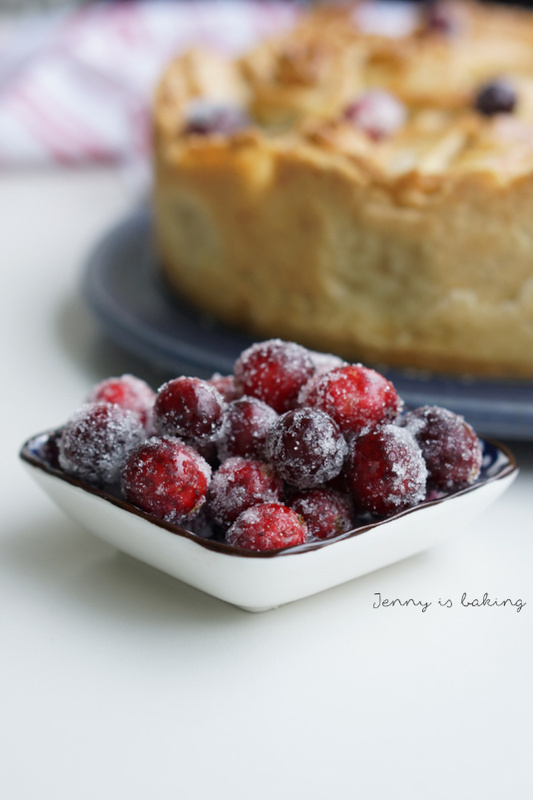 Let cool completely before serving and sprinkle with sugared cranberries. As always I am taking this to the link party Fiesta Friday, which is cohosted by Judi from Cooking with Aunt Juju and Liz from Spades, Spatulas and Spoons. Wow – really stunning pastry work! This is an absolutely beautiful pie! I wish I had the patience to make a fancy crust. Thanks for sharing! It was like meditation for me! 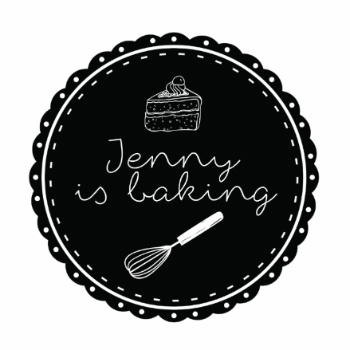 Jenny, this is such an amazing pie! It looks so delicious and beautiful! Thank you! It was so much fun making it! Love, love, love your rose crust. What a great idea Jenny – I always use leaves and such. I will definitely have to do that with my next apple pie. 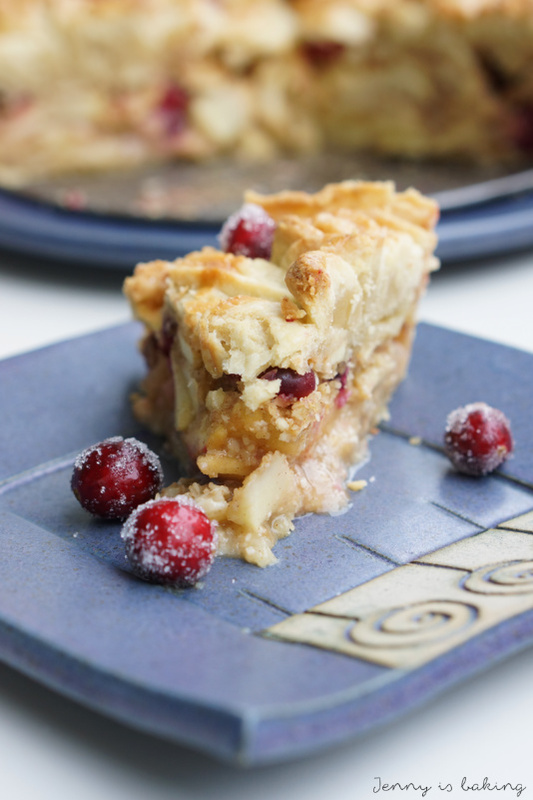 I like that you “kicked up” a traditional apple pie (just apples) with the cranberries and almonds. This is a winner – thanks for bring such a pretty and delicious pie to Fiesta Friday. Thank you, Judi for your kind words! Absolutely stunning, you can bring this to my holiday dinner any day! Thank you for bringing it to FF. 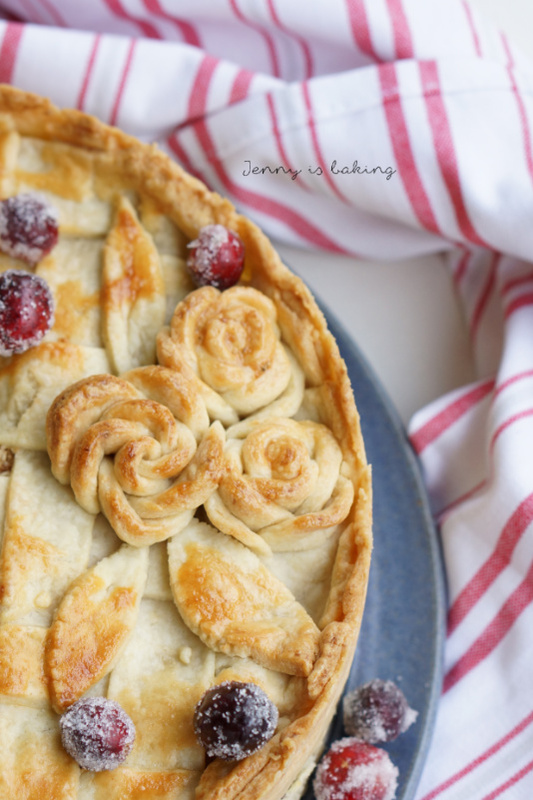 What a beautiful pie – I love the details you added to the crust! I’ve never had an apple pie with almonds in it before, but it sounds delicious. It is really delicious, you should give it a try! Thanks, it is actually not that hard and I think people overestimate how complicated it is. Thanks! It also tastes wonderful!